Obverse Image: Profile of an American Indian. Reverse Image: American bison, or buffalo. Please note, Buffalo nickels do not contain any silver. Please see below to view composition and today's metal value. This can be a highly-collectible coin, please view the numismatic value range to understand if your coin could command a high premium. $0.0399171 is the melt value for the 1913-1938 Buffalo Nickel on April 25, 2019. The PCGS price guide on Buffalo Nickels has an updated list of certified coin prices. 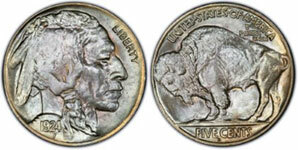 The 1937 D three-legged buffalo nickel is also a popular variety and highly collectible. PCGSCoinFacts has an estimated survival of 10,000 specimens for this coin and values can range from $400.00 up to $7,500.00.